Anyone who has played Far Cry 3 will tell you just how amazing the game is. Now, the game’s developer, Ubisoft has decided to take it a step further and give it a nostalgic spin in DLC form. 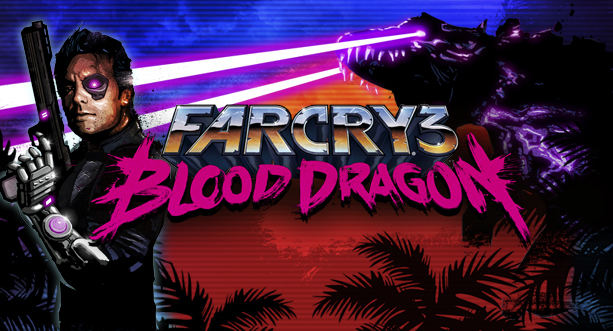 "Blood Dragon" (trailer embedded after the jump) is being described by Ubisoft as "an 80’s VHS vision of the future," and from the trailer, it certainly shows. As the neon lasers, mutants, dinosaurs, cyborg-infused characters, 80’s electro-synth soundtrack and bright florescent colors absorb into every one of your five senses, dreams from your childhood will flash before your eyes. It is as if someone took Robocop, Terminator and Nintendo, put them into a blender and topped it off with Captain Power. And if that’s not enough, sprinkle on a soundtrack by electronic music duo Power Glove. Now there is one tasty game. Players assume the control of Cyber Commando Rex Colt (voiced by Michael Biehn!) as he battles an army of enemy cyborgs known as Omega Force in order to get the girl and save the world. Biehn actually talks about his involvement with IGN.The gameplay is, obviously, that of Far Cry 3 and, though it is a DLC, it will be standalone DLC, meaning you don’t need to own Far Cry 3 in order to play it! The game is available now on PSN and XBox Live! With a price of only $15, it's worth downloading and showing 'em how Cyber Commandos get it done! Check out the trailer and Biehn's IGN interview below.